The seahorse is a very interesting creature that there is plenty to learn about. These facts will help you to identify with them more than you did before. The live in the tropical waters of the temperature locations and in shallow water. They don’t have scales even though they look like they do. They swim upright that is very different from other aquatic life. They aren’t related to any real horses but the name comes from the facial characteristics that are similar. Seahorses have a small crown on them called a coral net. It is unique for each of them. They don’t swim very well but rely on the dorsal fin to help them move. The two eyes of a seahorse are able to move independently of each other. 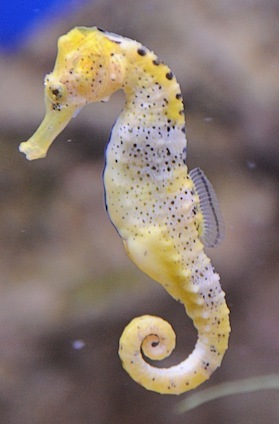 The male seahorse is the one that will carry the eggs. He will have them in his body for up to 45 days and then they will emerge full grown. Less than 1% of all young survive to the age of maturity. This could be why the female will deposit up to 1,500 eggs into the male during the mating process. The seahorse doesn’t do well in captivity due to high levels of stress. In spite of this fact many people continue to keep them as pets. More than 20 million seahorses are caught annually to be used for Chinese forms of medicine. The seahorse features a prehensile tail that allows them to pick up items and to hold them. They can also use those items in the water just like we do with our hands. It is a common myth that all seahorses stay with the same mate for life. Due to not swimming well they can die from exhaustion in high currents. This includes when the weather becomes severe in what is usually a very calm body of water. A seahorse doesn’t have teeth and they don’t have a stomach. They have to eat constantly due to the fast process of digestion. Almost all of the life of the seahorse has to be spent resting or eating. They have the ability to change color to blend into their surroundings. A seahorse isn’t able to bend their tail backwards. The size of a seahorse can be as small as ½ inch tall. The largest ones are only about 8 inches tall. Penguins are one of the most common predators of the seahorse. Others include tuna, stingrays, manta rays, and crabs. The seahorse swallows its food supplies whole. This is why they have a snout that is large – and it often seems too big for their small bodies. Water pollution and commercial fishing are both serious threats to the future of the seahorse. The seahorse will use the tail to fight if necessary. This is common among males during the mating season. Females will fight with each other or with males over territory as well as food sources. The seahorse has no limbs so and not dangerous mechanisms. Their only defense against predators is that they are able to hide so well, even in plan sight based on their particular surroundings. The average life span in the wild for a seahorse ranges from 4 to 6 years. It is much less for those in captivity due to stress, poor conditions, and the high risk of disease.